Jim Corbett National Park is one of the oldest national parks in India, established in 1936 in Nainital district of Uttarakhand. It is one of the largest and well protected habitats rich in varied flaura and fauna. 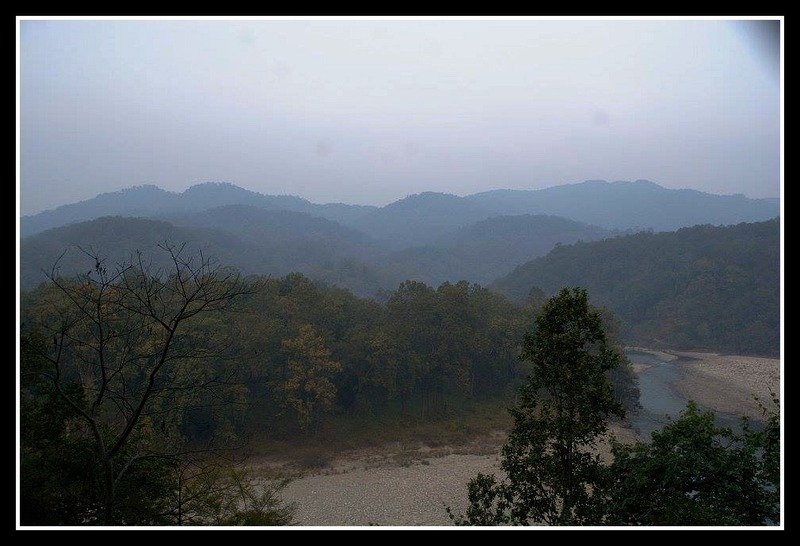 What I most love about Corbett is the unadulterated Forest feel you get when you are there. It is not like going inside in a well caged van in a small area of quasi captive animals. Corbett is the real thing, it feels like being inside the forest, an unadulterated jungle where the Cheetals, Sambars, Boars, Monkeys, live, eat, mate, get killed by predators like Leopards and Tigers. It is one of the few places in the world where one can see the Royal Bengal Tiger in its Natural Habitat. Corbett is a huge jungle of 1288 sq. km which has 110 types of trees, 51 types of shrubs, 27 types of climbers and 33 types of bamboo and grass. Although its sounds a little documentary types, I would like to list the variety in Corbett as it is not a good idea to be obsessed with Tigers while Visiting Corbett. Corbett is much more than a tiger spotting place, it’s a jungle in the real sense. Sheesam, Dhak, Sisoo, Khair, Chir Pine, Banj Oak, Kusum, Bel, Jamun, Aamla, Kanju, Mahua, Bakli are some of the main trees found in the Corbett. Peacock, Jungle Fowl, Bush Chat, Hornbills, Emerald Dove, Red Wattle Lapwing, Asian Paradise Flycatcher, Kingfishers, Indian Shirks, Woodpeckers, Laughing Thrush, Vulture, Parakeet, Khaleez Pheasant, Oriole, Common Grey Hornbill, Ducks, Storks, Cormorants, Indian Roller, Teals and Terns etc. 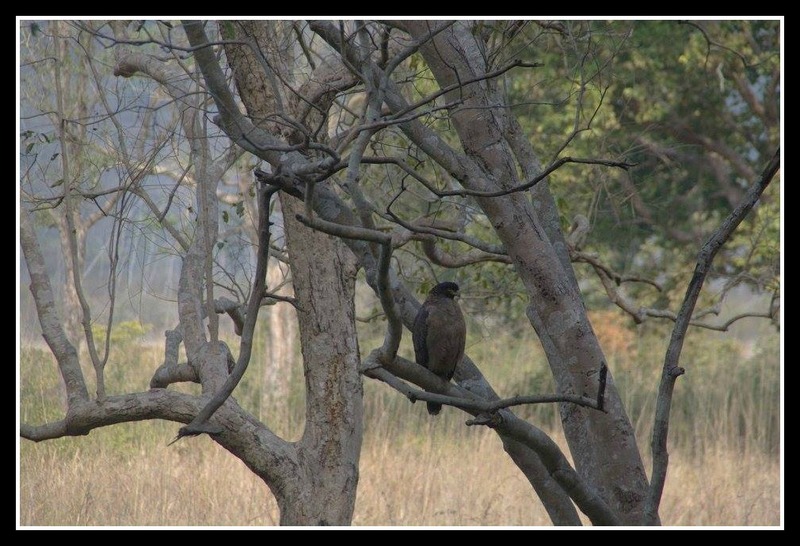 are some of the birds that you can find in Jim Corbett National Park. Crocodiles, Gharials, King Cobra, Krait, Python and Monitor Lizard etc are some of the reptiles that can be found in the Corbett. In Dhikala, there are also specific Crocodile View points where one can often see the Crocodiles and Gharials chilling in the river banks. Even if you dont see the crocodiles in their the time you go, this is one of the spots where you are allowed to get off the Jeep and the place is beautiful and picture worthy. Kalimuchi, Mahaseer, Goonch, Kalabasu, Chilwa etc are some of the fishes. I don't think you can spot them, unless you go fishing and are pretty damn good at catching them. It is surely not allowed in a place where you are not allowed to step out except in designated zones. Royal Bengal Tiger, Common Leopard, Jungle Cat, Asian Elephant, Yellow Throated Marten, Hog Deer, Spotted Deer, Barking Deer, Chital, Sambar Deer, Serow, Goral, Wild Pig, Langur, Rheus Monkey and Jackal etc. Asian Elephants are found only during November and December and migrate to other side of the mountains to the Rajaji National Park during other times of the year. No other animal other than elephant is typically migratory in nature. So all kinds of Deers, Boars, Jackals can be found at all times. The cat family is elusive and the predators can be difficult to spot. The deers and the monkeys do a great job of alerting the other animals once it finds one of these cats which is what the trackers refer to as the 'Call' and is a sign the predators are around. Royal Bengal Tiger is indeed the hero of the jungle and most people who visit Corbett come there to see one. Even if one goes there to enjoy the jungle like I did, the ubiquitous ‘dhikha?’ (‘saw’)every time a jeep passes by and the casual conversation in the Forest Houses all center around the elusive magnificent being, The Royal Bengal Tiger. I just couldn’t get myself to use the word Beast for it is the most majestic walking thing I had ever seen. Spotting a tiger in its natural habitat is a mesmerizing event and an experience that wildlife enthusiasts would die for. It is a game of skill, keen observation, patience, perseverance and sometimes dumb luck. That’s why when you go wildlife sighting; you need patience, a good tracker and loads of luck to spot these elusive beings. Although it was much of dumb luck that led to us spotting 3 tigers in just two days of Safari, I can help you avoid some typical First timer mistakes that vastly reduce the possibility of spotting a tiger. Corbett is a place where the rules evolve by the day and it is best to check what rules apply currently. During the initial days it was possible to just walk into the tiger reserve with a nominal ticket. Today, it is not allowed to even step down from the vehicle in other than designated areas. Even a few years earlier, it was possible to drive down into Corbett with your own Jeep. Today, Numbered Jeeps that are registered with the forest office, green in color and with a driver who has 5+ experiences driving inside Corbett are the only ones that are allowed inside Corbett. This is great for a traveler as it avoids a lot of con men and the park authorities can be sure that the rules are adhered to as the drivers have much at stake when any of their guests attempt to break them. Bookings for all the above may be done online here and stamped at Ramnagar Forest Division. One other zone called Sonanadi which is also open through the year can be booked from Kotarwada. You can walk into the RamNagar Forest Office with your permits and hire a jeep from there for your needs. The government approved rates depend on the visit/stay location and number of days and are available near the reception counters in a rather sober style and not prominently displayed. The middle men might con you and you may better check the display for current rates. Day safaris are allowed in five of the six zones in Corbett Tiger Reserve. These Zones are Bijrani, Dhangari, Jhirna, Durgadevi and Sonanadi (Kotdwar) and may be booked here. It is recommended that you stay inside the Forest to be able to enjoy the Safari and better your chances of spotting a Tiger. If that is not an option for you and all you can afford is only a Day trip, my top recommendation would be to book for a Day Safari in Bijrani. Bijrani is mostly dry grasslands, so although not very pleasing to the eyes, due to the lesser density of vegetation, there is a very good chance of spotting a tiger. The least favored option is to take a canter inside the forest. Canters are open 16 seater buses conducted by ‘Ramganga Conducted Tour’ that follow a standard route inside of the Dhikala Zone. Since it follows a well-established route and hardly ventures into the forests, you will experience nothing close to the fearsome wildlife movies your booking agent will probably show you. Most canter experiences are utterly disappointing and best avoided unless you just wanted to check Corbett off your list. Outside the forest, Ramnagar and Dhikuli are good places to find reasonable and accessible accommodations based on the zones you are visiting. Day visit to all zones are strictly regulated and only a limited number of vehicles are permitted entry during each morning and afternoon. A safari lasts for around four hours with a break in the afternoon. Best way to experience Corbett is to stay in the Forest Rest Houses. Indians can book their accommodations 45 days in advance while Foreigners can book their 90 days in advance. SAARC nationals pay the same fees as that of Indians while other foreigners pay significantly higher fees. According to the site one can book only between 1- 3 nights at a time. But most veterans use ingenious jugaads to book much more days. It is typical for a regular visitor to stay upto a week and a number of wildlife photographers stay for multiple weeks, in the hope of a good picture. This is mostly accomplished by using multiple Id cards to use the online booking loopholes. The Forest authorities are well aware and do not seem to mind. Infact one is not even required to go to the gates for use of a different permits for successive days. Tariff details may be found here. Of the above only Dhikala, Bijrani and Gairal have Canteen facilities, all other Forest Rest Houses, have a kitchen with utensils. All ingredients for cooking need to be brought by the visitor from outside. Please do remember it’s a jungle and no shops are available inside. With Safari starting as early as 5 AM and the other Forest Houses further away from the main zone, having to cook and make your own tea is not a great idea at all. Electricity is not available at any of the FRHs except at Dhikala. Some campuses have a limited Generator backup. Elephant rides at Bijrani and Dhikala ecotourism Zone are available to guests who stay there on a First Come First Serve Basis. There are only 4 people per Elephant and at a nominal rate of Rs.300/ per person it is one of the best ways to explore the jungle and spot tigers as one can go beyond the rough route guide map followed by the Safari Jeeps. Day safaris in two shifts, one in the morning and the other during the afternoon are available for visitors to Corbett Tiger Reserve. The safaris are as per prescribed timings with a break during midday. Timings are subjected to change depending on the season. 15 Nov to 15 Feb. 6.45 a.m. 1.00 p.m. 4.00 p.m. 5.00 p.m. 4.30 p.m.
16 May to 15 June 5.30 a.m. 3.15 p.m. 5.45 p.m. 6.45 p.m. 6.15 p.m. In Corbett Tiger Reserve, minimum temperatures can reach as low as 2°C, in the months of December and January while the maximum temperature during the months of May and June reaches as high as 42°C. So carry appropriate clothing and other accessories. All the adult visitors are required to produce any one of the following identity cards (Voter ID, Driving License, PAN Card, Govt. Employee Card, Passport and Student ID) on demand by officials of Corbett Tiger Reserve for verification at the entry point and whenever asked. Once you obtain a permit online, please take the printout and get it stamped in the Ramnagar office. Your physical presence would be required for the same but you may obtain the stamps a day earlier so as to avoid wasting time. For better sighting, take good quality Binoculars, DSLR with appropriate lens for good pictures. Thermals, Gloves and clothing in black, brown and green shades that can blend well with the forest background. You may consider carrying snacks, sandwiches, tea in flasks along in Safari as most of Safari involves long waiting periods. 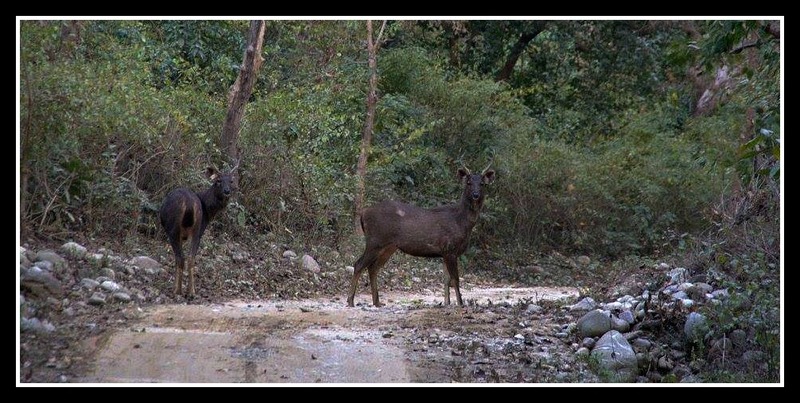 Jim Corbett National park is not a zoo. Most people stay over many days take multiple Safaris to be able to spot a Tiger. Do Not expect to go inside and see one immediately. If you have such expectations you would be better off visiting a Zoo. Please be respectful to the animals while shooting pictures. No Flash photography and do not ask for the Jeep to go too close to the animal and don't do stupid bravery stunts like getting off the Jeep. What is rarer than spotting a Tiger is being able to photograph one. Tigers are often spotted far away, rather suddenly, inside the bushes and not in the clearing, crosses over quickly and a million other reasons why you may not be able to take a picture even when you see a tiger. So don’t be disappointed with yourself for having not captured the moment. Just feel lucky to have seen it. If you did manage to get a good shot, it is an incredible event and worth a big celebration. Smoking and Alcohol is strictly prohibited inside the forest premises and you may be outs from the FRH’s by the Forest Officer for any violation. You will be back in your rest house by 5 PM, plan for some activities or reading late till Dinner.